AT&T made a ratherstrange announcementa few months ago regarding FaceTime. The US telecommunications giant said that users would only be able to use FaceTime, an app created by Apple to allow face-chat between iPhone users, if the user agreed to buy into a share plan. In the weeks that followed, many customers and public interest groups have went against AT&T to try and change this demand. Verizon and Sprint, the two other cellular communication and data providers in the US, allow users to use FaceTime over cellular without any extra cost. AT&T have finally went against their previous decision, saying that they will allow FaceTime over cellular without a shared data plan, but this offer is only extended to iPhone 5 users. All users that have iPhone 4S or below cannot use this service without a shared plan. This has caused controversy again, with many saying that FaceTime should be free-to-use over cellular without the company imposing their share plans. According to many groups fighting for net neutrality, this is seen as a breach of use and AT&T shouldn’t be the gatekeepers of app use. Many groups have said they will still take issue with AT&T and complain to the FCC over the fact AT&T have breached Net Neutrality principles and FCC laws, unless AT&T extends the offer of free FaceTime over cellular to every iPhone user. 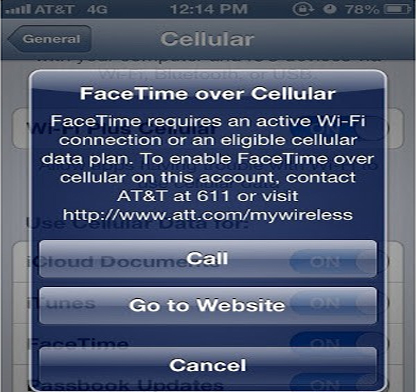 AT&T have yet to make a comment on the matter, but with an eight to ten week wait until iPhone 5 users not on a shared data plan are allowed, we suspect it will take a while till every AT&T iPhone user will be able to use FaceTime over cellular.